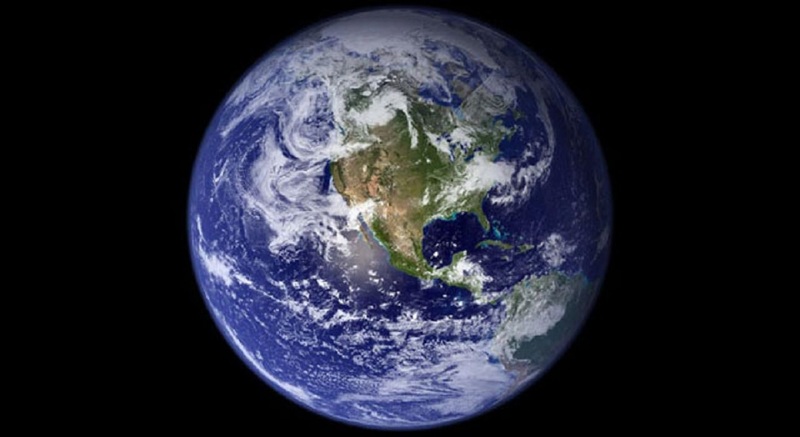 Why do photos of Earth always have a black background? Then how come almost all of Earth's photos look like this? In the first photo, we are seeing what is "outside Earth", and so if we actually went "outside Earth", why don't we see these gases? Is it because of the Sun blinding our vision? Suppose a satellite was hovering over the part of Earth where its night time (very little sun interference). If it "turned around and faced the opposite direction from earth", it would see the void, but would it see all these gases, or just the black void. The photo of the Milky Way is an exposure that was 30 seconds or longer in order to capture the stars. The photo of the Earth was an exposure that was probably 1/100 of a second. (It is daytime!) The stars will not appear in such a short exposure. 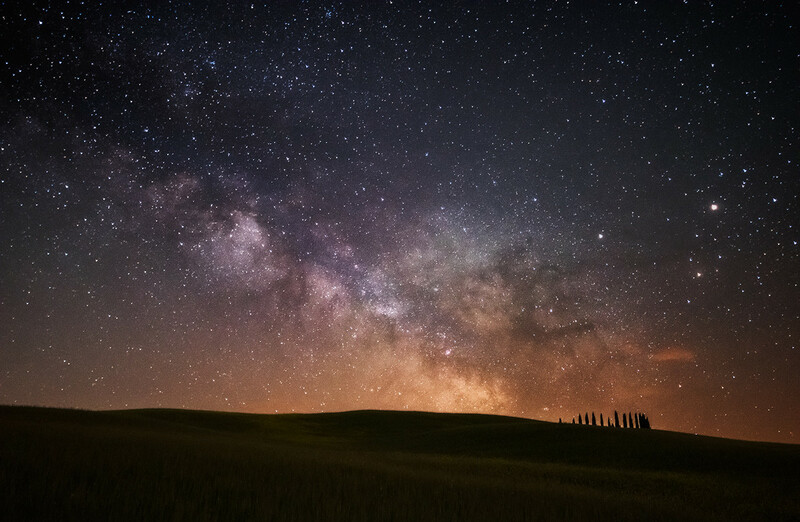 As viewed from nearby, the sunlit Earth is far brighter per unit area than the starry sky because the Earth fills the sky as a solid body, but the stars are tiny, tiny dots filling only a very small portion of the sky -- much less than a pixel. So a properly exposed picture showing the sunlit Earth against space will completely underexpose the stars, leaving space looking black. This doesn't happen in a nighttime picture of the moonless sky from Earth, because there is no sunlit landscape to drown out the stars. (Though just the dim nighttime skyglow does a pretty good job.) If the Moon is int he shy, once again, all but the brighter the stars will be invisible. If you are in space and aim your camera away from the Earth, Sun and Moon, and if your camera is well designed so that the len is properly shaded from all three, you can get wonderful images of the starry sky -- better than from on Earth. Hubble does this all the time. Note that the things that look like gasses in the picture of the Milky Way are actually almost entirely swarms of stars that the eye can't resolve. Photos of Earth from space do not always have a black background (the other answers explain why usually, they do). 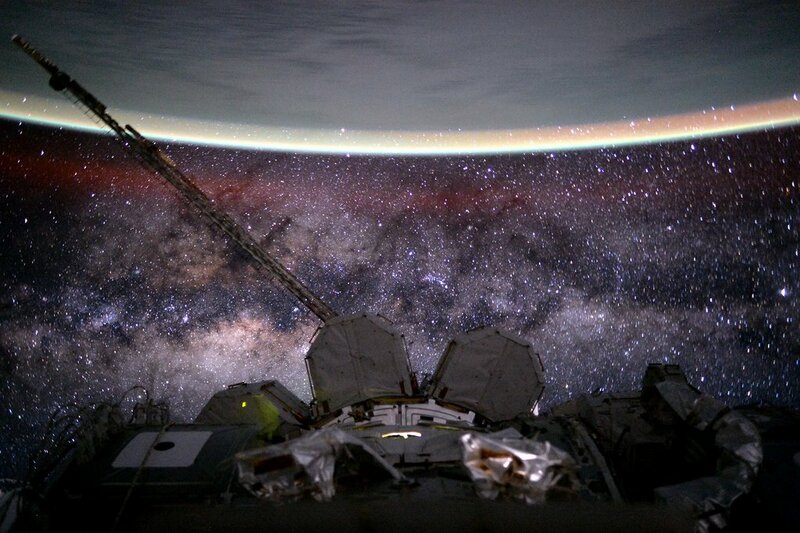 NASA Astronomy Picture of the Day, Milky Way seen from ISS, taken by Astronaut Scott Kelly on August 9, 2015. See also this timelapse on youtube. Not the answer you're looking for? Browse other questions tagged star galaxy earth amateur-observing photography or ask your own question. Could any known, living organisms on Earth survive on Mars? Why are distant galaxies not visible in the observable Universe? Are there stars in the first photo from space? Why Earthian atmosphere is so thin? Would space-based telescopes need to remain in the shadow of Earth to avoid light interference from the sun?